Air Vent, the industry leader in residential attic ventilation has a shingle-over, edge-of-roof installed intake vent – The Edge™Vent. It not only provides continuous intake airflow at the roof’s edge but it significantly simplifies intake vent installation by keeping the roofing contractor on the roof. Air Vent’s The Edge™ Vent provides proper intake ventilation for homes with little or no overhang. It’s a roof-top installed, shingle-over intake vent designed based on roofing contractor feedback from our Ask the Expert™ seminars. It can be used to supplement existing soffit or undereave vents as well. 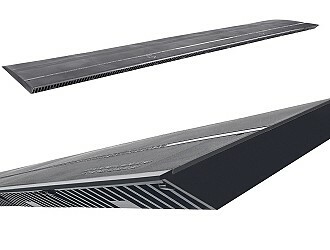 The Edge Vent provides 9 square inches of net free area per linear foot to balance with ShingleVent® II ridge vents and other Air Vent exhaust vents. When installed in accordance with manufacturer's recommendations, Air Vent products comply with the net free area requirements of nationally recognized model codes, including those written by BOCA, SBCCI and ICBO. Here's an overview of the specifications for Air Vent's complete line of intake ridge ventilation products. 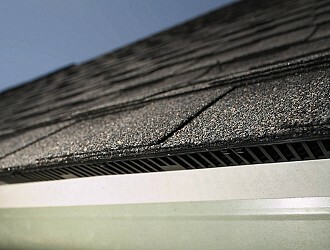 The Edge™ Vent EVI Shingle-over, roof-top installed intake vent Black 11.4" x 48" 9 sq. in. per ft.
Mill, Brown 2-3/4" x 96" 9 sq. in. per ft.
Construction) White 2-3/4" x 96" 9 sq. in. per ft.
(Retrofit) White 2-3/4" x 96" 9 sq. in. per ft. Oval Undereave Vents OEV436BR Plastic Brown 22"
Oval Undereave Vents OEV436WH Plastic White 22"
Vented Drip Edge VDE Aluminum White 10' 9 sq. in. per ft.
To use this calculator, first find the total square footage of the attic floor area. Round your calculations up to the next highest number (see Ventilations Requirements). Then look across to the number under the Minimum Length of Ridge column. That tells you the total linear feet of ridge vent required using the 1/300 minimum code requirements. Note: because today's tighter homes require more airflow, the 1/150 ratio is also included. To balance your ridge vent system, find the length of the ridge and follow the column to the right for required intake vents (see Balancing Your Ridge Vent System). Note: Calculations are based on ShingleVent II and Multi-Pitch FilterVent which provide 18" of net free area per linear foot. 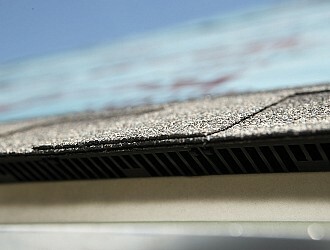 Editor’s Notes: By relying exclusively on ShingleVent II ridge vent for exhaust ventilation and eliminating the roof louvers and gable louvers Buck Roofing & Construction addressed the potential weather infiltration and inefficient airflow performance that can result when two types of exhaust vents are mixed on the same roof (known as short-circuiting). Editor’s Notes: Calkins Construction used ShingleVent® II ridge vent for exhaust and then balanced the attic system with The Edge Vent for intake. “This house had no overhang at all. The homeowner was experiencing ice backup for years. He contacted numerous contractors about this; but no one was able to solve his problem, he said. ‘Knowledge is Power.’ I informed the homeowner about The Edge Vent. At first he was reluctant but after educating him about this ventilation product he decided to proceed with the work. After a long and hard winter—problem solved.” – Mark J. Dee, President, Cleveland Remodelers, Inc.
Editor’s Notes: For exhaust ventilation ShingleVent II ridge vent was used. Cleveland Remodelers learned about the above project because of a referral from a satisfied customer across the street. And since then, The Edge Vent customer has referred his next door neighbor to Cleveland Remodelers. “The Edge Vent is an excellent product. The homeowner has seen a drastic improvement in the air temperature in the upper level of his home; which ultimately will increase the longevity of the roof life of his home. Our Project Manager Jake Geisler evaluated the roof and worked closely with the local Air Vent representative Bill Pierro to specify The Edge Vent for this house that did not have an overhang for traditional intake vents.” – Jason Vogen, CEO, Elite Exteriors. Editor’s Notes: This two-story house previously had individual roof louvers for exhaust ventilation without any intake ventilation (the house does not have an overhang/soffit). Elite Exteriors balanced the attic ventilation system by replacing the roof louvers with Air Vent’s ShingleVent® II ridge vent for exhaust and added The Edge Vent for intake. Check out this short video filmed by longtime ShingleVent II ridge vent user Bill Thomas (Mechanicsville, MD) featuring Air Vent”s ridge vent and The Edge Vent. In 4-short minutes Bill details many of the key installation steps. “The Edge Vent is very easy to use and adds so much intake ventilation without worrying about the existing soffit vents. Thanks to The Edge Vent I am able to educate homeowners about their roofing problems and find a suitable solution. It is a good ’common sense‘ solution to most roofing problems. I absolutely love the product and recommend it to all homeowners.” – Tom Galgerud, President, Monarch Siding & Windows. Editor’s Notes: Tom attended Air Vent’s Ask the Expert™ educational seminar 1st quarter 2010 in Omaha and credits the seminar with further enhancing his attic ventilation sales presentation skills. It’s also where he learned about The Edge Vent. For the project above ShingleVent II ridge vent was used for exhaust. “I absolutely love the concept of The Edge Vent. The low profile blends in perfectly. More than ever we are finding opportunities to use this product.” – Eion Kelley, Owner, Northeast Contracting Corporation. Editor’s Notes: It’s acceptable to move The Edge Vent up the roof away from its intended edge-of-roof location if the roof has open soffits (exposed rafter tails) in which the attic itself actually begins up the roof OR if the house construction/framing blocks intake airflow at the eave. For all other applications, however, The Edge Vent is intended to be positioned at the very edge of the roof. If attic insulation is blocking the incoming airflow where The Edge Vent is supposed to be installed, Air Vent recommends addressing the insulation blockage point not moving The Edge Vent. “A customer I met with had serious roofing ventilation issues. The house had blind soffits and was not vented at the eave. The homeowner is an engineer and is well aware of the fact that adequate intake is just as important as exhaust. We knew there had to be a way to properly ventilate the house while allowing the customer to maintain the manufacturer’s shingle warranty. I recommended The Edge Vent, explained how it worked, and how it would work with his exhaust vents to form a balanced system. I was so impressed with the results that I have installed The Edge Vent on my own home which used to have ice dams. I added The Edge Vent to the trouble spots and the ice damming has stopped.” – Jan Brewster, President, Patriot Construction. Editor’s Notes: The photos show The Edge Vent installed up the roof a few feet in order to allow the intake airflow to enter the attic which physically starts several feet above the edge of the roof. In situations like this—known as open soffits/exposed rafter tails—it is acceptable to position The Edge Vent up the roof a few feet. Editor’s Notes: A vapor barrier was added to the deck before the 1.5″ risers were added to create the vent cavity. 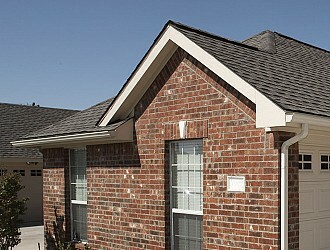 Address: 4146 S. 1420 W.
“Many homes in south Irving, TX area have no overhang. We were contracted to put a new roof on this house. Our evaluation of the attic ventilation showed the homeowners they had no intake. Without intake, Air Vent’s Edge Vent was our solution. Texas has brutal summers. The homeowner has commented that adding The Edge Vent made a significant difference.“ – Jake Jacobson, Vice President of Sales and Customer Service, SF5 Construction & General Contracting, Inc.
Editor’s Notes: For this application it was necessary to use vented nail board because the existing tongue & groove deck didn’t have any insulation properties. The Edge Vent allowed the contractor to meet intake ventilation requirements without disturbing the historic wood soffits. “This home had huge ice dam problems due to poor ventilation and their heat bills were virtually through the roof. …The home was a cape cod style structure so we cut in The Edge Vent along the bottom edge for intake and ShingleVent II on the ridge for exhaust. The homeowner was quite excited for the first winter without ice dam problems. He is also looking forward to the LP truck driving past his house and not stopping to fill his tank every 2 to 3 weeks because he was out of LP. This is definitely an Edge Vent & ShingleVent II success story.” – Chad Strander, Owner, Strander Roofing & Seamless Gutters. Editor’s Notes: Strander Roofing & Seamless Gutters installed 2 layers of 3-inch insulation (R-Value of 42) and applied fir strips over the top of the insulation; then installed the sheeting to the fir strips. Address: 7670 Nineteen Mile Rd. 1) Cut the airflow slot in the roof. 2) Install the first layer of water-protective membrane under the vent on the bare deck. Cut out the area for the airflow slot. 3) Chuck added a piece of metal flashing under the mitre cut for added protection since the roof has two different slopes coming into a valley. NOTE: The airflow slot is kept away from both the valley and the end of the eave. 4) Install The Edge Vent. 5) Install the 2nd layer of water-protective membrane over the vent. NOTE: Be sure the factory cut end of the vent (built-in end plug) is facing out. 6) Install starter shingles and then shingle-over the vent. Editor’s Note: The valley starts out with a weave for the 1st row of shallow slope and two rows of steeper slope to help with the slope transition and the "bump" in The Edge Vent. Image 2) Put first layer of Ice/Water Shield and cut out where air slot is. Image 3) Added a piece of metal flashing under the mitre for added protection since this roof had two different slopes coming into this valley. Note the air slot is kept away from both the valley and end of eave. Image 4) Install Edgevent and put second layer of ice and water. Be sure to use factory end on the edge and the cut towards the inside. Image 6) Finished product, note that the valley starts out with a weave for 1st row of shallow slope and two rows of steeper slope to help with the slope transition and the “bump” from the Edgevent. Here’s a step-by-step look at installing The Edge Vent. Viewer alert: Keep an eye out for climate-appropriate underlayment under and over the vent. Whether the roof has overhangs or not, Air Vent’s Edge Vent provides proper intake ventilation for the exhaust vents. Its shingle-over design blends with the roof and its rooftop installation keeps the roofing contractor in complete control of the entire attic ventilation system. See how it installs and its three layers of weather protection. Check out this short video filmed by longtime ShingleVent II ridge vent user Bill Thomas (Mechanicsville, MD) featuring Air Vent’s ridge vent and The Edge Vent. In 4-short minutes Bill details many of the key installation steps.